Virtual Attendant Service in the Cloud. The new speech based virtual operator is now available on the Waycom Cloud. Any Voip PBX can harness this service, once connected in vpn with the Waycom Cloud. 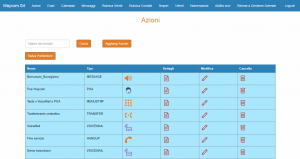 Through a simple graphical interface it is possible to define the service functionalities of the virtual operator, by setting the opening time schedules & calendars, messages and user/office names, with the corresponding. The integrated voice mail offers the messages transcriptions (Voice to Text) as well as the attached audio files. 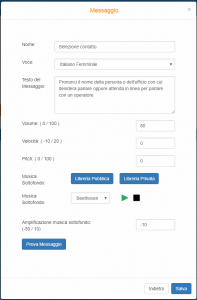 A simple web panel allows you to generate messages with speech synthesis, in different languages and with different voices. The latter can be “mixed” with background music already available or uploaded to “upload” from your PC.